Is Daredevil Nik Wallenda Tempting God? NIK WALLENDA AT PRACTICE THIS WEEK IN ADVANCE OF HIS GRAND CANYON SKYWALK. After his death-defying, history-making walk last year on a tightrope, several hundred feet above Niagara Falls, Nik Wallenda this evening will defy death yet again in his live televised walk across the Grand Canyon. The walk will be 1,500 feet above northern Arizona’s Little Colorado River Gorge, known by locals as “Grand Canyon East.” The distance between Wallenda’s tightrope and the bottom of the gorge is equivalent to the distance between the top of Empire State Building and the sidewalk below. So if Wallenda is off his game Sunday evening, if he suddenly encounters high winds or other deleterious conditions, he can easily plunge to his death. Like his great-grandfather Karl Wallenda, who in 1978 attempted a walk between the twin ten-story towers of the Condado Plaza Hotel in San Juan, Puerto Rico, only to fall to his death before a live audience. Many think the late Karl Wallenda’s great-grandson is tempting God by continuing to undertake extremely dangerous “skywalks” without benefit of a harness or a net. 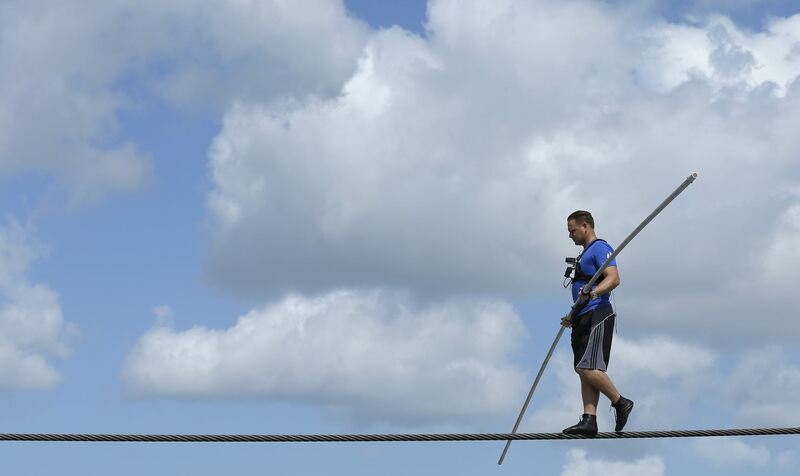 But 34-year-old Nck Wallenda, a purpose-driven Christian, sees it differently. Wallenda professes that his high-wire act, which will be viewed by a national television audience, brings glory to God. He holds fast to his faith that God will be walking alongside him when he’s high above Grand Canyon East, as He was when the daredevil was high above Niagara Falls. I also am persuaded that Wallenda has a unique anointing. Indeed, there were many, no doubt, who witnessed his Niagara Falls walk on TV, who heard Wallenda calling upon the name of the Lord during the live telecast, who were motivated by the Holy Spirit to seek Christ.. Similarly, there will be many who tune in tonight to see if Wallenda loses his life on live TV while attempting to traverse the spectacularly terrifying Little Colorado River Gorge or if Wallenda’s God once again delivers him from the clutches of death. I, for one, believe God is with Nik Wallenda. And if the daredevil looks heavenward during his skywalk tonight, I believe he will see the Lord, high and lifted up. 23 Jun	This entry was published on June 23, 2013 at 6:25 AM. It’s filed under ENTERTAINMENT and tagged 'BALANCE: A STORY OF FAITH, 'SKYWIRE LIVE', AND LIFE ON THE LINE', current-events, FAMILY, GRAND CANYON, NIK WALLENDA. Bookmark the permalink. Follow any comments here with the RSS feed for this post. He is a top bloke ! Good on him for having a go! The Scripture says that “when Peter had come down out of the boat, he walked on the water.” Was he a sick man or did he step out in faith? And where is the Gospel of Jesus Christ in all of this?